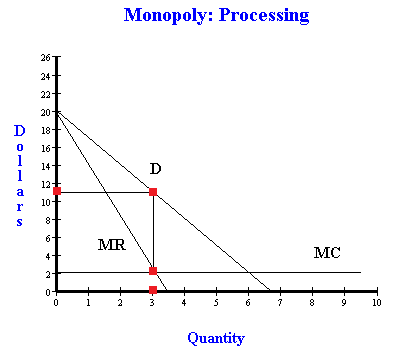 Monopoly and monopolistic revenues, equations, elasticities, and price discrimination - FreeEconHelp.com, Learning Economics... Solved! (1) the market for fluid milk (milk for drinking) and (2) the market for processing milk (for manufacture of cheese, etc.). Your preliminary analysis has generated the following demand curves for the two separate markets. 1. What is the profit-maximizing allocation of milk production in each of the markets? Assuming that MMM can practice price-discrimination in the market, what is the profit-maximizing price and quantity in each market? 2. What is the total revenue for the MMM using price discrimination? 3. 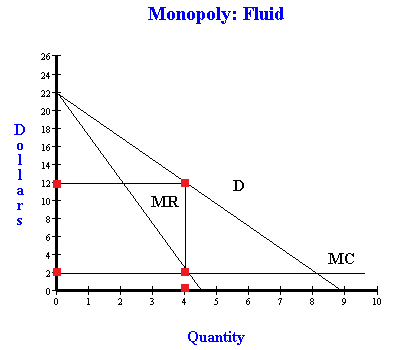 Calculate the own price elasticities of demand for fluid and processing milk at the equilibrium values for P and Q. 4. Illustrate the effects of price discrimination with a graph of both the fluid milk market segment and the processed milk market segment. Your graph should include a demand curve, a marginal revenue curve, and the profit-maximizing price and quantity under price discrimination. If the price without market discrimination is $11.50, which segment of the market benefits from market discrimination? The first thing we need to do is find the profit maximizing quantity. 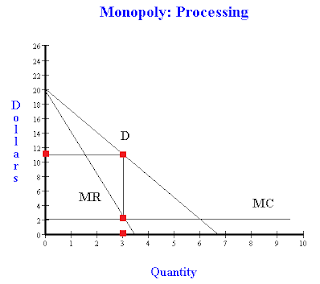 To do this, we have to remember that for a any business (including monopolies) the profit maximizing point occurs when marginal revenue is equal to marginal cost (MR=MC). So first we have to identify what marginal revenue is, and luckily that is given above. In order to calculate marginal cost, you can either take the derivative of total cost (TC) or find the slope of the TC curve. Either way you will end up with MC=2. So equilibrium price will be 12. So equilibrium price in the processing market will be 11. 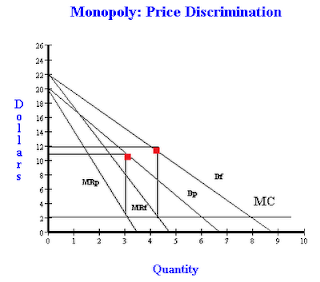 If our producer is allowed to price discriminate, then the equilibrium price will be used in either market, so revenue will be price multiplied by quantity. This results in revenue of 12*4=48 for the fluid market and revenue of 11*3=33 for the processing market. Where our linear demand curve is q=a-bp. So in the above equation, a = 8.8, and b = 0.4. P and Q are still 12 and 4 respectively. So our point price elasticity of demand measure at equilibrium price and quantity for the fluid market is -1.2. So the price elasticity of demand for both markets is elastic, this means that if revenue for the firms could be increased if prices went down (but just because revenue would rise, doesn’t mean profit would, because we have positive costs). Finally, the graphs for the two markets would look like the graph to the right. Here we can see the MR=MC at a point where P (in dollars) is $2, and quantity is 4. However, when we figure out what the price paid by the consumer will be, by drawing the line up to intersect with the demand curve, we get a price paid of $12. The next graph to the left shows the monopoly market for the processed milk. 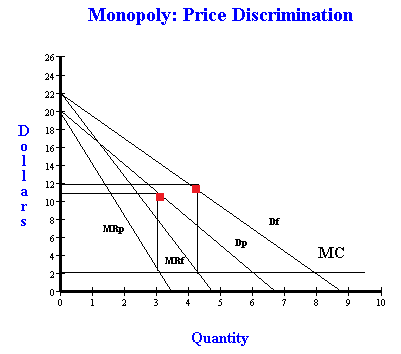 Here, MC=MR again at a price of $2, but since the MR curve is steeper, the quantity is only at 3. When we draw the line up to intersect the demand curve, we see that this intersection occurs at a price of $11. And if we put the graphs together, we get a very complicated graph, be we can see how the firm is price discriminating in the two different markets. And if the price of milk was $11.50 with the opportunity for price discrimination than the fluid market would lose revenue because they are currently charging $12 for their milk, while the processing market would receive $0.50 more because their current price is only $11.